I can’t believe that today is our last full day in Belize. While I am excited to take a warm shower and have clean clothes, I am also incredibly sad that this amazing experience is coming to an end. 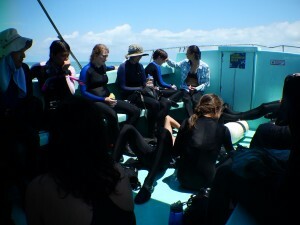 Today’s activities began with a snorkel in the sea grass beds and back reef on the left side of the island. Even before the swim started, I saw two species of piscivorous fish at the dock: a small nurse shark swimming about, and a school of needlefish. Once on the back reef, I also saw French grunt, bluestriped grunt, squirrelfish, and a very cool houndfish that was about two feet long. During this morning snorkel, we also collected a bunch of samples of different organisms in order to be able to look at certain species more closely. The only piscivorous fish collected was a poor French grunt that had accidentally been speared during an attempt to catch an invasive lionfish. After analyzing some coral monitoring data from yesterday, we got to dissect lionfish! My group’s lionfish was quite small, but still cool to look at. The fish are being made into ceviche as I write this! 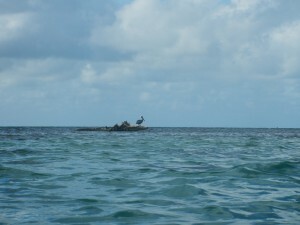 We ended the day with a visit to another island of Glover’s atoll, Southwest Caye. It’s amazing how little of this amazing environment we’ve been able to see, even with a whole week of exploring. Guess we have to come back! Today was really cool because we brought a clear conservation viewpoint into our projects. In the morning, we created a project about marine debris. We had a dual purpose in this: beach clean-up and exploring the composition of marine debris on the windward side of the island. In total, we picked up 41.22 kg of debris in an hour, and we barely scratched the surface of the trash that was washed up on the shore. By mass, almost 50% of the trash was plastics, but styrofoam also made up a large proportion of the debris picked up. Overall, the sheer amount marine debris found is quite disturbing, especially knowing that much of it could come from landfills. 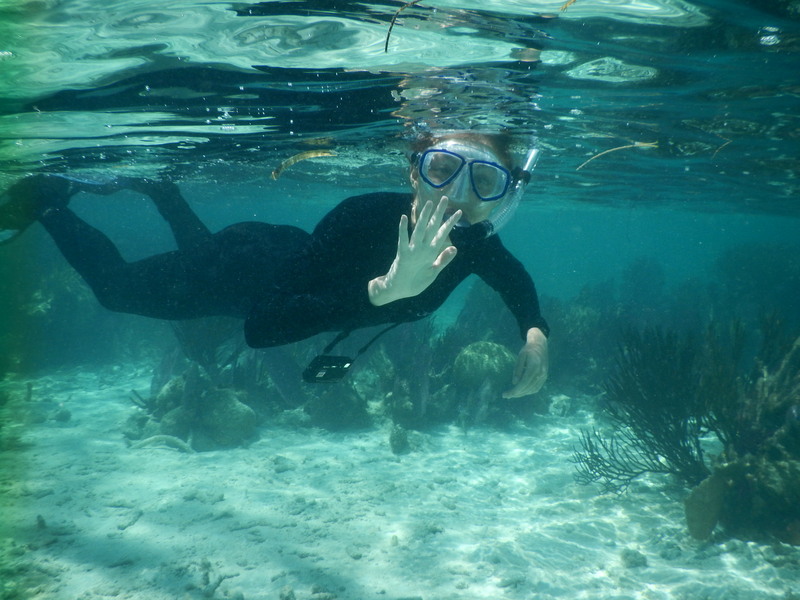 After lunch, we braved the mosquito mangroves to explore another part of the back reef. Here, each group of two used quadrats to measure a single coral colony that had also been measured the year before. Hopefully we will be able to use these measurements to determine whether or not the colonies have been growing over the past year. In terms of piscivorous fish, I saw a few identifiable species today. Most of these were seen during our night snorkel, which was super fun! Some species included squirrelfish, a tarpon, a porgy, and an invasive lionfish (whose venomous spines I almost swam right into). Overall, the night swim was probably my favorite snorkeling activity so far! Day 12 was all about atoll structure. We did two snorkeling swims today on different parts of the atoll. In the morning, we visited what is known as the fore reef, which is the part of the reef outside of the atoll’s ring of reef crest. 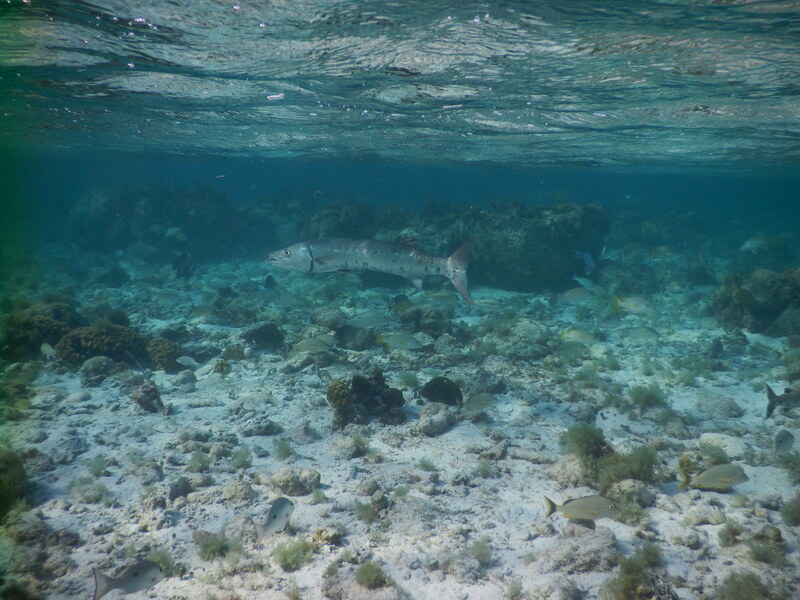 The afternoon’s snorkel was on the back reef, the section of the reef near the reef crest on the inside of the atoll. The fore reef snorkel was incredible, up until the point where I started feeling sea sick and had to lie on the floor of the boat (along with all the other nauseous people) for the rest of the trip. 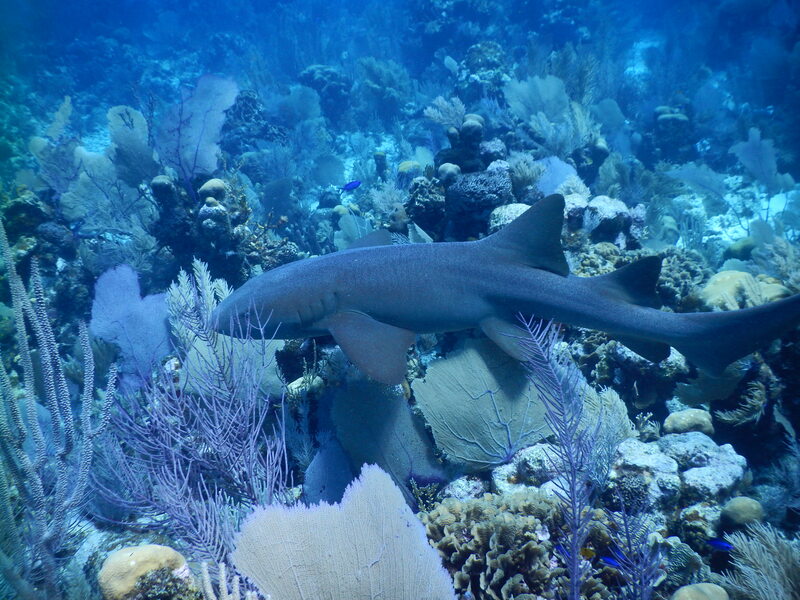 Before that, though, I got to explore the deeper reefs of this area. Three southern stingrays were seen on the sandy bottom between sections of reef. 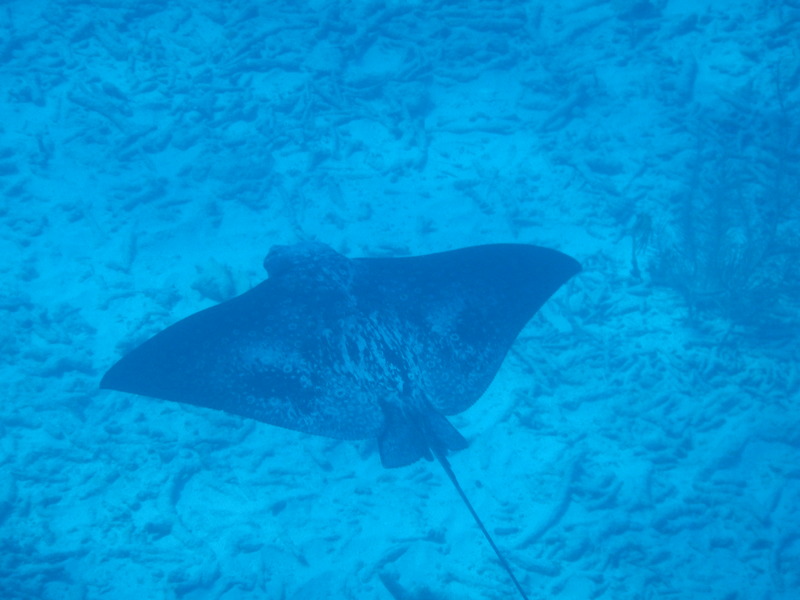 The coolest sighting of the day was of a huge spotted eagle ray near the deepest part of the reef. At one point the creature flipped around, ate something, and then swam off into the depths. After finishing some data analysis for our reef health study from yesterday (relatively inconclusive), we took to the waters again, this time to explore the shallower, calmer back reef. 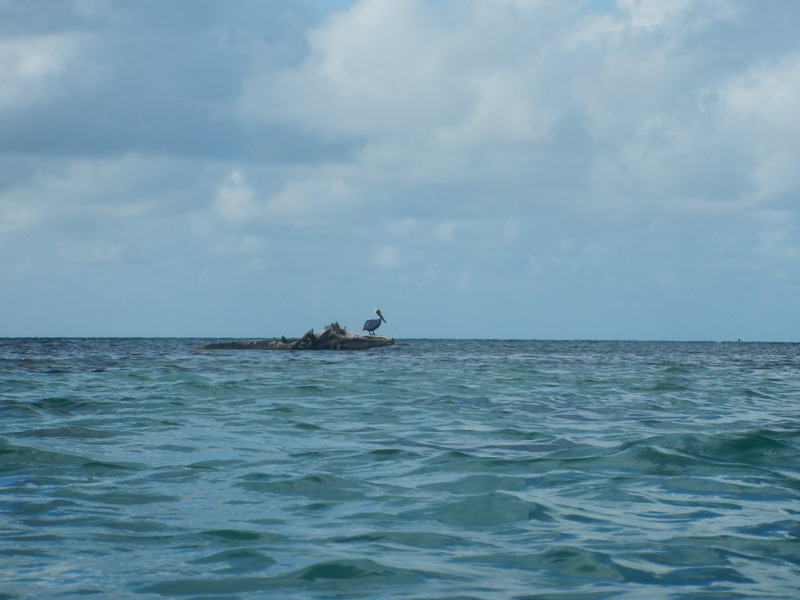 The area was a mix of sea grass, sand, and coral areas, and the species were very diverse. 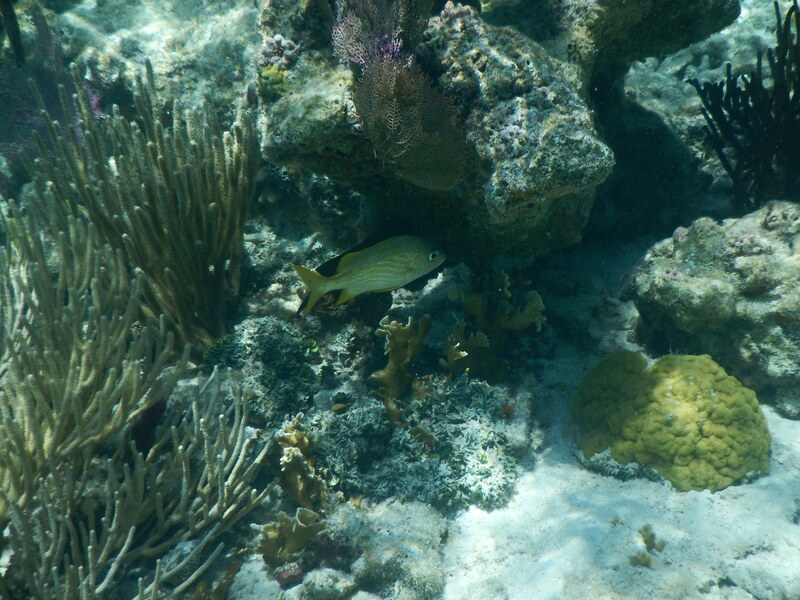 I saw many bluestriped and French grunts swimming between the corals, along with a five-foot long barracuda! I also saw a sharptail eel swimming around in the rubble, another southern stingray, and a smaller barracuda chasing after some unknown species of fish. Today was also special in that we got a very interesting presentation from Javier Garcia about the history of Belize’s people. It’s incredible how diverse both the human and wildlife populations are here! I almost started writing this blog earlier this evening, but instead decided to go out on the dock and look at the stars. Thank God I did, because gazing at the stars was the best part of a fantastic day. Not only is the shear number of stars mind boggling, but the juxtaposition of the vast ocean with the greater enormity of space is quite thought-provoking. I wish we could be surrounded by this much wonder all the time. As for the rest of the fantastic day, we spent a ton of time in the water, which was so fun. We took our transects and quadrats to the ocean, using them to measure stony coral cover on various patch reefs, which is an indicator of reef health. By doing this analysis both within and outside of the Marine Protected Area, we can look at how protection affects reef health. We also collected sea urchins in both localities, as these species are especially influential on reefs. I saw some really cool animals today on the reefs! Right after jumping off the boat, a great barracuda swam by, but it was still very small in comparison to its maximum size of two meters. One of the coolest sightings today was a sharptail eel (Myrichthys breviceps) snaking through the coral crevasses. Anna and I also saw a giant, very colorful lobster. Some other piscivorous fish sightings included French grunts and an unidentified species of snapper with huge red irises. Overall, a day that really made me appreciate coral reefs in a new way. 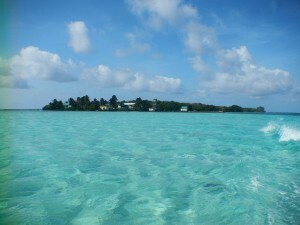 Day 10 was our first real day at Glover’s reef atoll. 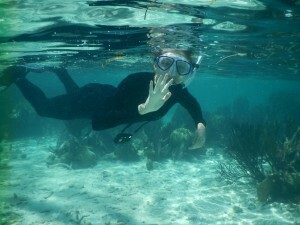 We started out with a snorkeling scavenger hunt on two of the patch reefs near the dock. It was so fun! Some especially exciting finds included a small barracuda in the sea grass beds, many bluestriped grunts all over the reefs, a yellowtail snapper, and damselfish defending their “gardens”. We didn’t see all of the organisms or processes on the checklist, but hopefully we will in the next few days. After doing some transect and quadrat practice on land, we took these to the water post lunch to try and quantify two genera of green algae: Halimeda and Penicillus. Lying out the transects and counting the algae in the sea grass beds was really difficult, but hopefully it gave us good practice for doing it on the coral reefs. We saw some really cool species during our afternoon snorkeling. 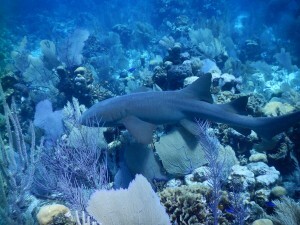 Two nurse sharks were spotted. One was small and swimming around the dock. The other was apparently much larger and farther out past the sea grass beds, but I was a little too slow to see it! 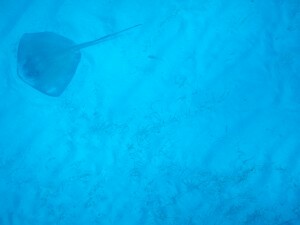 We also saw some more barracudas, and another ray. Unfortunately, my camera died, so pictures might be a bit sparse after this (yes Papi I know, I should’ve brought the GoPro). I can’t believe how much we did today! After our second snorkel, we headed to a coral graveyard on the other side of the island. There we found the ground covered in fossilized coral pieces, so well preserved that we could see the details of specific species. 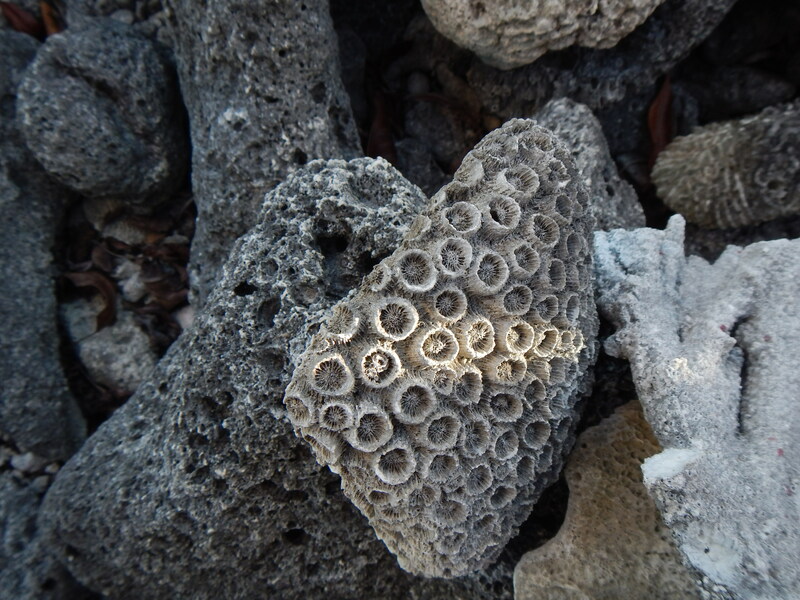 It was both beautiful and a little sad, as some of the coral species seen in the fossils are now very rare. It served as a good reminder of the work to be done in order to save these fragile ecosystems. Today was officially our last day on the mainland until we leave for the airport. I’ve felt very weird about this all day. 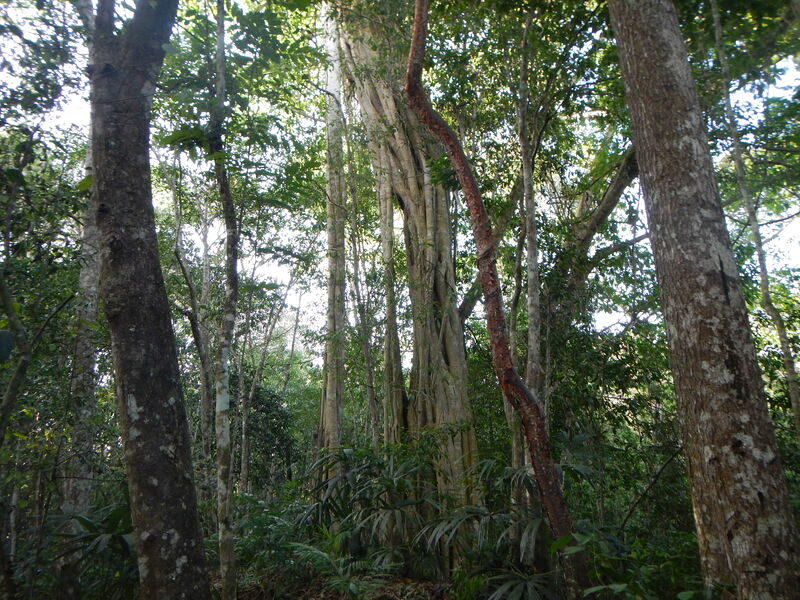 Coming from the forest, any signs of humans almost felt claustrophobic. Once we got on the boat and out to sea, a feeling of freedom seemed to overtake all of us (besides those who get seasick). 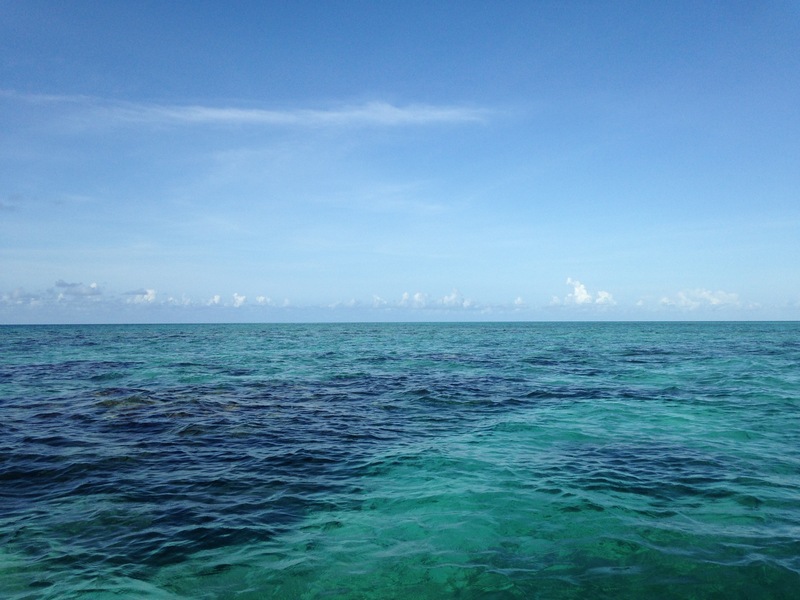 But upon arriving at Glover’s reef on Middle Caye, a sense of both awe and discomfort hit me. This place is a fantasy. 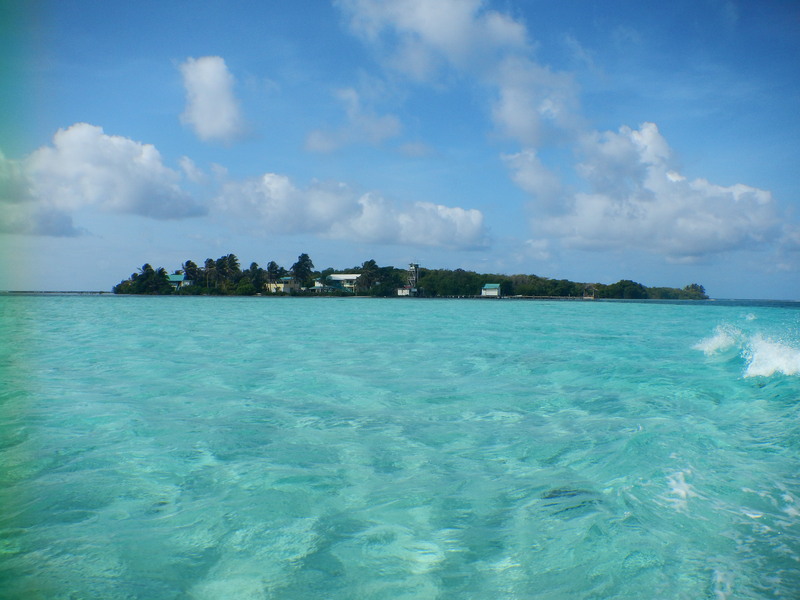 Crystal blue waters of different shades, dotted with sandy mangrove islands. I swear the Pirates of the Caribbean movies were filmed here. The research station is perfectly fitting to the scene, simple yet clean. Somehow though, the whole environment feels a little alien with its huge expanses of ocean after the life-infested rainforest. I’m sure going below the water to explore the amazing ecosystems will change this feeling again! Back to animals. 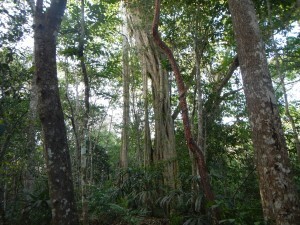 For some final mammal sightings, we stopped by the Belize Zoo again in the morning. 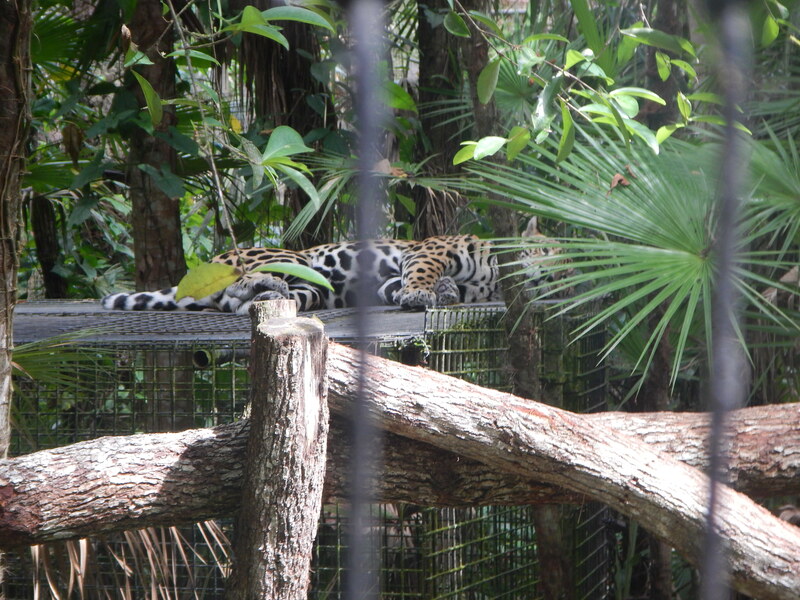 This time, we spotted a gray fox, two jaguarundis, a margay, and a couple of jaguars. Then it was off to the piscivorous fish! 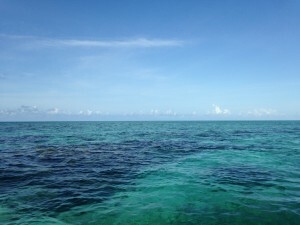 During our brief first snorkel experience, I recognized yellowtail snapper and bluestriped grunt in the sea grass and on the patch reef than we swam around. 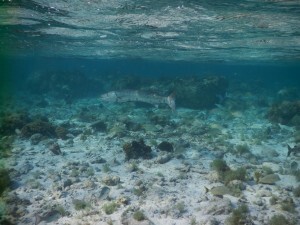 Some other students saw a great barracuda, one of the coolest predatory fish in my opinion. Another great thing about Glover’s: the food. The cooks are amazing! Looking forward to breakfast. This trip has seen a variety of transportation mishaps, but today took the cake. After a final morning walk, we were all set to leave for ATM cave at 7am. However, the van was not, as it had not even left its starting point, which was hours away. So we had some nice time to talk with other group members, get a presentation out of the way, and have lunch. Finally the van appeared around noon and drove us to Georgeville, where we were to meet our tour guides for the ATM cave. 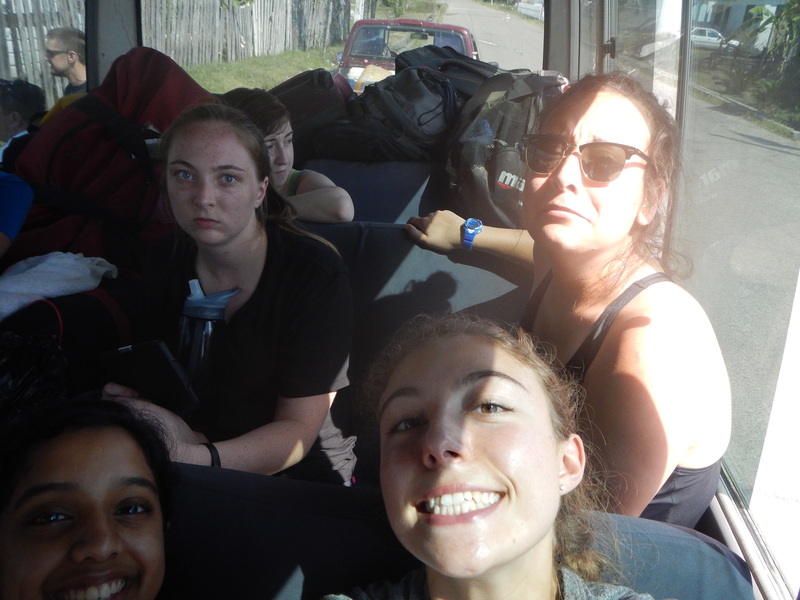 However, upon arriving at the town, it became clear that it was too late to go to ATM cave (plus the bus driver wanted to drop us off and leave), so we instead stopped for lunch at the Orange Gallery, and then headed off (with a new driver) to the Belize Zoo. 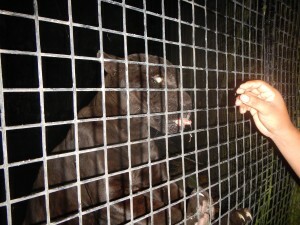 The night tour of the Belize Zoo was one of the coolest things we have done so far. We got to each feed a tapir named Indy, and see two pacas, a Morlet’s crocodile, and many other species. However, the best part of the zoo tour for me was the cats. We got to see four of the five species of cats that inhabit Belize (the jaguarundi is diurnal and thus was not out). We met a black jaguar named Lucky Boy, a very vocal ocelot, a small puma of the Belizean variety, a margay with ankles that can rotate 180 degrees to climb down trees, and another jaguar who did tricks. The Belize Zoo is an amazingly natural place that not only rescues individual animals, but also uses these individuals as ambassadors for conservation. Their pride in their natural heritage was truly inspiring! Today we took on the 14-mile hike to pick up the camera traps that we put out on Wednesday. We picked up seven traps before lunch, and five traps after. This time the trek went significantly faster and was much easier, though my full-leg red rash reappeared. I’m really hoping this won’t be a recurring issue in the future. A few different species of mammals were seen today, most of which were caught in the camera trap images. Though I did not see it, apparently an agouti was seen by others in the group during morning bird watching. Some really exciting species were caught by the traps. Another agouti and an ocelot (!!!!) 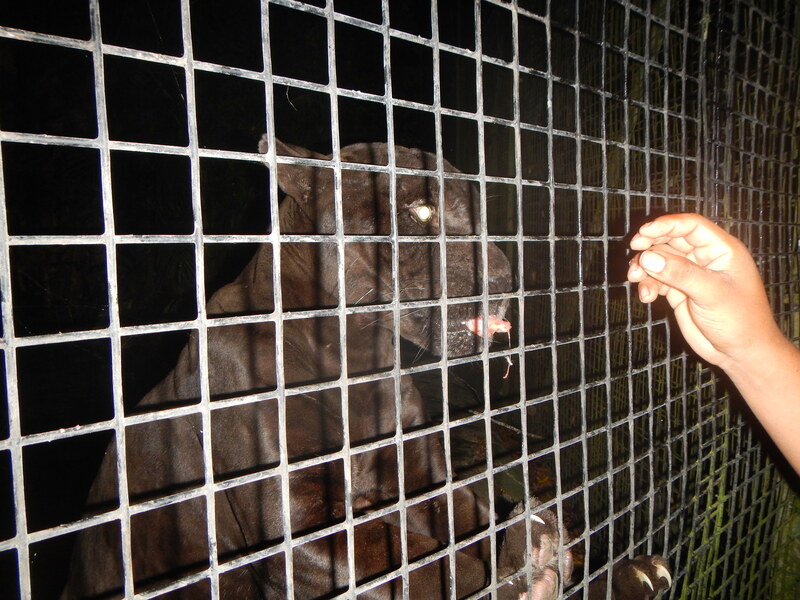 were caught by the same trap in a naturally open area, at different times. We also got a great picture of a tapir (endangered species) along a human path. Though the sample size of species in our camera trap images was small, all of this was still super exciting for me, especially the ocelot capture. I also gave my mammal taxon briefing in the evening. This was my favorite of all the presentations to make and give, and I really enjoyed watching others using some of the information from my presentation in attempting to identify species in the camera trap images. It’s pretty sad to have to leave this place. The rainforest is magical in the amount of life it holds, and even though I’ve barely slept all week, I’ve felt as strong as ever here. Hopefully I can return some day!